Hangzhou/Beijing, June 26, 2008. Only two months after the world premier Shanghai Volkswagen launched its brand new A-class model Lavida in Hangzhou on Wednesday. 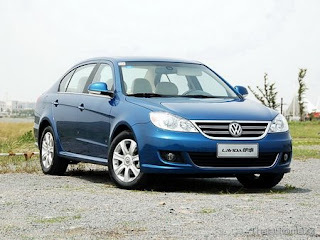 The Lavida is the first model which was entirely designed and developed at Shanghai Volkswagen, combining Asian style with Volkswagen engineering. It extends the car manufacturer’s product range in the volume segment and is available with a 1.6l/ 77kW and a 2.0l/88kW engine both with manual and automatic transmission. All models fulfill the China emission standard IV, which corresponds to EU IV. Prices start from 112,800 RMB. The name "Lavida" was derived from the Spanish language and represents a zest for life, hope and passion. The design of the Lavida does not follow any familiar pattern. 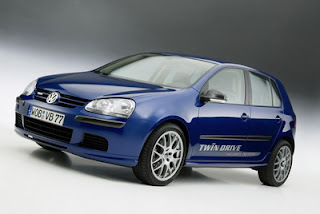 Nonetheless, its design exhibits a logic of forms that is typical of Volkswagen. The front end is marked by a design that – with its horizontal lines – represents the "Volkswagen face" of the future. Powerfully contoured is the engine hood, distinctive is the tornado line that rises toward the rear. As a whole, the side profile expresses a decidedly sporty image. The taillights take on the almond-shaped design of the headlights, the rear end itself on the other hand assumes the same vertical posture as the front end. A trailing edge was integrated in the design of the trunk lid; the spoiler lip contributes to the very good aerodynamic properties of the Lavida. ntuitive controls are to be found inside every Volkswagen. Naturally, this applies to the Lavida too. The interior is characterized by an extremely ergonomic design, and visually it reflects a perfection of details that is typical of Volkswagen with its harmonious lines, fine wood applications and high-end surfaces. In general, the interior design and features consistently satisfy the wishes of Chinese car drivers as has been found in numerous surveys. One of these wishes: a USB interface for an MP3 player like the one that has now been implemented in the Lavida. Shanghai Volkswagen offers the Lavida in the equipment lines "Trendline", "Comfortline" and "Highline". The base vehicle already has ample features with ABS, driver and front passenger airbags, climate control, MP3-capable CD-Radio, power windows and anti-theft warning system. The even more luxurious versions "Comfortline" and "Highline" also get 16-inch alloy wheels, a chrome package, sliding sunroof, leather seats, side and head airbags, cruise control, parking sensors, automatic climate control system and CD changer. Besides the listed features, the Highline variant of the Lavida also has a DVD-supported navigation system and telephone preparation. Thailand's automobile industry is expected to produce 2.5 million vehicles including the new eco-cars by 2016, leading to demand for another 200,000 workers, according to Atchaka Sribunruang Brimble, the director-general of the Industrial Economics Office. Every sector in the industry must co-operate to build up the manpower base needed, she said. Higher-skilled workers will help support the industry to make quality products and increase productivity. Also, a skilled workforce will be better able to absorb new manufacturing engineering and technology. At present, human resource development is centred in educational institutions, while many car companies provide training in both theory and practice. Under the existing master plan for the industry, Thailand is on track to achieve its goal of building 1.8 million vehicles by 2011. ''That goal is not too hard to reach since we are able now to produce 1.6 million vehicles per year while many automakers are moving ahead to raise their output to meet export demand,'' said Ms Atchaka. Once local automobile output reaches two million units per year, exports will be half that. The small, fuel-efficient eco-cars are meant primarily for the export market. To help develop auto parts manufacturing, the master plan also contains a six-billion-baht parts testing centre and proving ground to enable Thai auto parts to compete internationally, said Ms Atchaka.After Thailand shifted its policy to developing exports from import substitution manufacturing in 1994, the kingdom became the base for automobile production in Southeast Asia and now is the production centre for most major car brands worldwide. Thailand ranks 15th in the world in manufacturing capacity, producing more than one million units per year. ''If Thailand were a car, it could be said that we are racing in the fast lane because our manufacturing capacity is going strong,'' she said. and support thepublic sector to build safety riding centers in Honor of HM the King, according to a release from the company. year for over 20 years ago and through its safe riding center it has trained more than 10.9 million people," it said. office building that includes 4 training rooms that can be combined to form a Iarge meeting room for up to 300 panicipants. 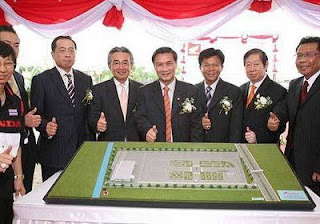 Construction of the new center will be completed by January 2009.
phet, Ubon Ratchathani, Burirum and Surathani while two more will be opened soon in Phitsanulok and Rayong. ln honor of HM the King, Honda will support the construction of 12 safety riding centers nationwide, undetaken by the Disaster prevention and Mitigation Centers, the Minist of lnterior. After being able to maintain high growth rates in the passenger car segment thanks to the popularity of the Mazda 3 Mazda sale Thailand co. Ltd (MST) has decided to penetrate the luxury SUV market with the award-winning CX-9 which will be launched during the year end period. 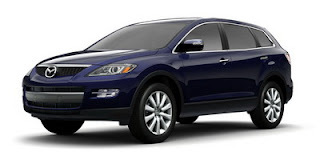 The CX-9 comes with 3.5 liters V6 engine capable of producing 250 hp. and 33.l kgm. of torque. lt also featurcs Mazda's Advanced Active Torque Split, AII-wheel-Drive system which electronically divides up power between the front and rear wheels. Safety features include a Roll stability control system, Dynamic stability control and traction control. Meanwhile, Mazda is also gearing up marketing for the launch of the Mazda 2 subcompact scheduled for next year. Kia is positioning the Mohave in the opposite fighting corner to the likes of the Mitsubishi Pajero, Nissan Pathfinder, Toyota Land Cruiser and Volvo XC90, and at first glance, if price is your primary reason for buying, then the Mohave will suit you well as Kia have pledged to undercut the Japanese makers, although no pricetag has yet been announced. So what does the Mohave offer? From the outside the angular face reminiscent of some of the Stateside 4x4s feels a little out of place on a Kia, but once you get used to its broad and gently sloping chrome grin and wrap-around headlamps, there is something quite forward-looking and simple about it, based as it is on the MESA concept first shown in Detroit in 2005. It’s not really until you look beyond the rear wheel-arch that the rear three-quarter window and sloping rear pillar giveaway that it is a Kia, but even then these characteristics are subtle. Once you move around to the rear once again there is a simplicity and a modernism about the wide tailgate window and the wrap-around LED brake lights that is appealing. 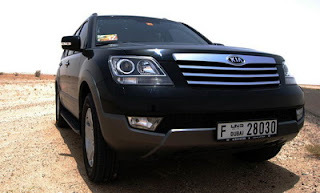 One assumes that Kia expect the Mohave to be used at least in some degree for rugged duties as it features a sump guard, as well plastic wheel-arch and lower door guards which lack subtlety and mimic again many US 4x4s, but do make the Mohave appear slightly longer. The interior of the Mohave shouldn’t really be a surprise by now. Kia have ploughed a lot of research and effort into refining the quality that the customer can expect for the amount of money they spend, and it seems that they have come up trumps with the Mohave. OK, the leather is not of the highest quality and the interior materials are not up to the standard of premium quality SUVs, but for perceived quality, texture, fit and finish, you really cannot complain. The Mohave features most mod cons that you would expect in vehicles of higher spec, including 8-way adjustable driver and passenger seats, electronic reach and rake adjustable steering, keyless entry, push button start/stop, HID headlamps, electronic pedal adjustment, satnav with integrated entertainment system with USB, iPod and AUX compatibility, cruise control, hill decent assist, fully independent front and rear suspension with electronic height adjustment, and 2H/4H/4L gearing selection. As the driver, the first thing you notice is the innovative design of the instrument cluster and the red backlighting when you switch on the lights. You also notice the subtle design elements such as the matt wood veneer or brushed aluminium effect inlays common to executive vehicles, as well as a quality of fit and finish that exceeds many of the Kia’s competitors. To drive, the Mohave feels fairly sure-footed and as responsive to inputs as you would expect a 5m long, 2m wide 7-seater SUV to be. The 3.8-litre V6 engine has a surprisingly throaty voice and with 270bhp and 362Nm of torque on call, it is also nimble off the line, reaching 100km/h in a respectable 8.5 seconds. Kia is also proposing to introduce a 4.6-litre V8 which should be even more impressive and will feature a 6-speed automatic box as opposed to the V6’s 5-speed auto. Highway driving is very comfortable in the Mohave although there did seem to be a low hum at 120km/h which sounded like it was coming from the transmission on the vehicle we had, and the side curtain airbags deployed for no reason on another vehicle. But these are teething problems we are assured. Off-road the Mohave could be quite adept. Unfortunately, Kia had obviously requested that the organisers make sure their new ‘tough guy’ SUV was treated gently with just a few light log obstacles, a run up a gentle dune and down again and a 50 metre slalom course. Not really what you would call a thorough test, but nevertheless the Mohave didn’t embarrass itself. After four years in development the Mohave looks set to be a serious contributor to Kia’s fortunes, especially in this region. Global sales are projected to be around 60,000 by the end of this year and 80,000 by the end of 2009. With Kia currently riding a wave of popularity with a range of new models due to be launched in the near future, of which the Mohave is just one, the company looks set to continue challenging several of the Japanese and US carmakers, especially with their very attractive servicing and warranty packages, not to mention the pricetag. With Kia you always used to get what you pay for: now you get even more. Expect to see it Kia showrooms by mid July. 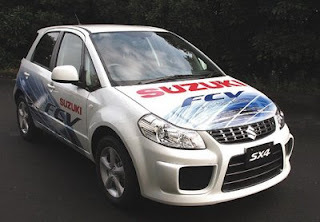 The SX4-FCV, a fuel cell based car using US General Motors fuel cell technology finally got final approval from the Japanese government. Shanghai Automotive Industry Corp. is not talking to Ford Motor to buy Volvo, an SAIC source said. "As far as I know, our company has never contacted Ford on the purchase of Volvo Cars," said the source, who declined to be identified. Speculation that Ford is planning to sell its Swedish brand Volvo -- possibly to a Chinese automaker -- was triggered by a report in Sweden's Dagens Industri business newspaper early this week. A spokeswoman at Volvo declined to comment on the rumors. Volvo Cars announced this week that it would cut 2,000 jobs, mostly in Sweden, as efforts continue to stem losses at the premium car brand. Ford Motor considered selling Volvo last year, but decided to hold on to it in November. A Ford spokesman said this week: "We have been consistently saying since the end of last year that Volvo is not for sale. We are focused on improving Volvo's business results." Related Article : Ford talks with SAIC to sell Volvo ? DETROIT, USA -- Fuji Heavy Industries Ltd., the maker of Subaru cars, will sell 61 million shares valued at 31.1 billion yen ($293 million) to Toyota Motor Corp., boosting Toyota's stake to 16.61 percent. Toyota, the world's largest automaker by sales, currently holds a 9.5 percent stake in Fuji Heavy, making it the company's top shareholder. The strengthened ties between Toyota and Fuji Heavy come as a number of major automakers are looking to strike partnerships to offset the cost of developing new cars and technology and to boost production in factories facing slack demand. Subaru and Toyota are already cooperating in hybrid technology, an area where Toyota leads the market. The increased investment by Toyota also highlights the auto industry's changing fortunes as General Motors, Toyota's largest rival in global sales, faces increasing pressure to shed assets and raise capital to restructure. GM sold a stake of just over 20 percent in Subaru in 2005, one of string of asset sales by the automaker over recent years that also included stakes in Suzuki Motor and Isuzu Motors. The sale of shares to Toyota is expected to be completed on July 14, Fuji Heavy said in a statement released in Tokyo. SEOUL, South Korea -- Hyundai Motor Co. plans to launch a hybrid version of the Elantra sedan next year in Korea. The Avante, the Elantra's name in Korea, will be the first hybrid vehicle to be produced, the company said in a press release. The Avante hybrid is powered by liquefied petroleum gas, which is mainly propane or a mix of propane and butane. Liquefied petroleum gas is an inexpensive fuel used in China, Australia and some European countries, such as Italy. 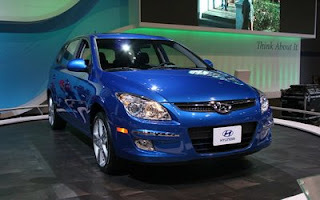 Hyundai plans a gasoline hybrid in 2010 and larger hybrid vehicles later. Hybrids use an internal combustion engine and one or more electric motors to power the wheels. The Avante will use lithium ion batteries, which are lighter and more powerful than nickel-metal hydride batteries used in the Toyota Prius hybrid. Hyundai predicts hybrid sales of at least 50,000 in the first full year of sales in Korea. Exports could begin as soon as 2010. So far, only next year's domestic launch has been announced. Plans also are in the works for a fuel cell car to be launched in 2012. Fuel cell cars are powered by electricity produced on board with hydrogen fuel. 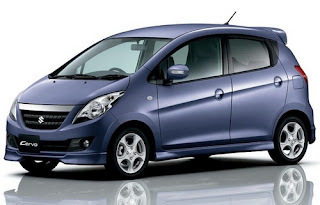 Since 2004, Hyundai has supplied about 3,000 hybrid versions of its Getz and Accent small cars to government fleets as part of a testing program. Apart from that, Hyundai usually points to the government as a problem. Korea lacks tax benefits for consumers who buy hybrids, but Hyundai expects the tax situation to change next year. 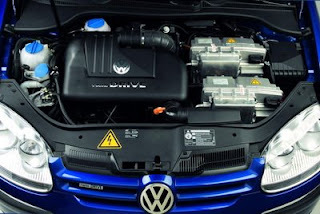 In 2006, LTC said that it was developing, in conjunction with a then-unnamed automaker (VW), a 12 kWh Li-ion battery system that should support a plug-in hybrid application in a four-passenger vehicle. 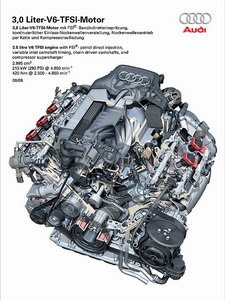 Audi has introduced a new top end to its V6 engine range: the 213 kW (290 hp) 3.0 TFSI with gasoline direct injection and compressor supercharging. The “T” in the Audi engine designation no longer exclusively denotes turbo versions. The new V6 will go into production later this year. Audi, which has a long tradition of supercharged engines, said that comparative tests showed that the mechanical supercharger was a superior charging solution to a biturbo concept for the 3.0-liter engine. In conjunction with direct injection, the packaging, starting performance and dynamic response of the supercharger were superior. Powerful, spontaneous and ultra-efficient: this is the new top version in Audi’s V6 engine range. The 3.0 TFSI develops 213 kW (290 hp) and a huge 420 Nm (309.78 lb-ft) of torque. It combines two state-of-the-art technologies in perfect style – gasoline direct injection and compressor supercharging. The hi-tech V6 will go into production later in the year. The brand with the four rings has a long tradition of supercharged engines. The legendary Grand Prix racing cars built by Auto Union back in the 1930s already featured compressors, which coaxed as much as 440 kW (around 600 hp) out of the mighty 16-cylinder and 12-cylinder engines. From the late 1970s on, Audi focused its attention on the exhaust turbocharger, which helped it to a succession of noteworthy triumphs in the world of motor sport. It was at this time that Audi’s turbo engines began to enjoy resounding market success. The compressor is now staging a comeback. It is the ideal supercharging technology for the new three-liter V6, the 3.0 TFSI; the T in Audi engine designations consequently no longer exclusively denotes turbo versions. Extensive comparative tests revealed the mechanical supercharger to be superior to a biturbo concept for this engine. In conjunction with direct injection, its packaging, starting performance and dynamic response were far superior. The compressor is so compact that it easily fits inside the 90-degree V of the cylinder banks, in place of the intake manifold. Because it is driven by the engine via poly-V belt, its full thrust is available from idle speed upwards, producing huge pulling power when driving off. The 3.0 TFSI delivers its maximum 420 Nm (309.78 lb-ft) at only 2,500 rpm and maintains this constantly until 4,850 rpm. The gas paths after the compressor are very short; this means that the torque is built up extremely quickly, even more dynamically than on a naturally aspirated engine of the same displacement. The 3.0 TFSI responds sportily to the throttle, with exceptional agility and bite. And it revs up to the maximum of 6,500 rpm with playful ease, achieving its rated output of 213 kW (290 hp) at just under 5,000 rpm. The 3.0 TFSI without question earns top marks for fuel efficiency, too. And its pulling power enables it to extend the transmission ratio, further adding to its already superior efficiency. The new 3.0 TFSI will achieve an average fuel consumption of well under 10 liters per 100 km (23.52 US mpg) in virtually all longitudinally engined Audi models, the concept for which it is envisaged. It is designed to run on either premium or regular gasoline and already complies with the future emission standard Euro 5 – a question of honor for every new Audi engine. The Audi technology of gasoline direct injection according to the FSI principle was what made this trailblazing efficiency possible in the first place. Unlike conventional concepts, it allows the compressor to be located behind the throttle valve. In view of the low density of the intake air at loads below supercharging level and when coasting, its rotors are free-running and the amount of power required to drive them is low. The engine’s high compression ratio of 10.5:1 also plays a big part in its efficiency. The direct injection principle is once again the key, because the intensively swirled fuel cools the combustion chamber, reducing the tendency to knock. The compressor of the new 3.0 TFSI is what is known as a Roots blower. Inside it, two four-vane rotary pistons counter-rotate at a speed of up to 23,000 rpm, with an air gap between them measuring just a few thousandths of a millimeter. The rotors can deliver 1,000 kilograms (2204.62 lb) of air per hour and force it into the combustion chambers at a boost pressure of up to 0.8 bar. Two water-to-air intercoolers made from aluminum and connected to a separate coolant circuit are integrated into the housing. Here, the compressed and therefore heated intake air is cooled down again in order to boost its oxygen content for the combustion process. An extensive package of measures reduces the level of noise generated by the compressor to a minimum. The engine itself belongs to Audi’s family of ultramodern V engines. In addition to the standard cylinder angle of 90 degrees, their attributes include systematic lightweight construction – the three-liter version’s crankcase, which is made from cast aluminum/silicon, tips the scales at just 33 kilograms (72.75 lb). The entire engine, including the compressor, weighs 189 kilograms (416.67 lb). The bore measures 84.5 millimeters (3.33 in) and the stroke 89.0 millimeters (3.5 in), producing a swept volume of 2,995 cm3. Audi has included a whole array of refined hi-tech features on the 3.0 TFSI. The crankcase has been adapted to the higher prevailing pressures and all components are frictionally optimized. The two intake camshafts can be adjusted through 42 degrees crankshaft angle. In the intake ports, tumble flaps induce movement in the incoming air to promote optimum mixture preparation. The injection system is a fundamentally new design. A common rail system with six-hole injectors injects the fuel directly into the combustion chambers at a pressure of up to 150 bar. The injectors’ highly dynamic response permits up to three fuel injections per operating cycle across an extensive range of the characteristic map. They, too, optimize the combustion process and therefore contribute to the impressive performance of the new 3.0 TFSI. Goodyear Tire & Rubber is planning to close its Australian manufacturing facility as part of its strategy to reduce high-cost manufacturing capacity globally and provide cost-effective value-added products that the market is demanding. AKRON, Ohio -- The Goodyear Tire & Rubber Company today announced plans to close its Australian manufacturing facility as part of its strategy to reduce high-cost manufacturing capacity globally and provide cost effective high-value-added products that the market is demanding. This action will eliminate approximately 3 million units of high-cost capacity and provide Goodyear with annual cost savings of approximately $35 million. "This completes our commitment to reduce high-cost capacity by about 25 million units and achieve annual cost savings of more than $150 million," said Goodyear Chairman and Chief Executive Officer Robert J. Keegan. "Going forward, our efforts will be focused on increasing production of high-value-added tires in low-cost operations to support growth in these segments in Asia-Pacific markets, including Australia and New Zealand." South Pacific Tyres (SPT) will immediately initiate communications with its 600 associates and union representatives regarding the plan to close the plant in Somerton, Victoria by Dec. 31, 2008. "Goodyear and South Pacific Tyres remain committed to their customers and a strong and ongoing product, retail and wholesale presence in Australia," said SPT Chief Executive Officer Judith Swales. Total restructuring and accelerated depreciation charges for this action are estimated to be approximately $125 million after tax, of which approximately $85 million is for cash charges. Goodyear anticipates recording charges of approximately $75 million after tax in the second quarter of 2008. Formed in 1987 as a joint venture, SPT has been wholly owned by Goodyear since 2006. The leading tire maker and marketer in Australia, it has more than 3,000 associates. Its results have been consolidated with those of Goodyear's Asia Pacific region since 2004. Goodyear is one of the world's largest tire companies. Goodyear employs about 70,000 people and manufactures its products in more than 60 facilities in 25 countries around the world. 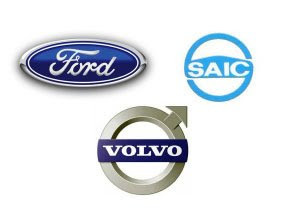 Article navigation: Home / Ford / SAIC / Volvo / Ford talks with SAIC to sell Volvo ? Ford talks with SAIC to sell Volvo ? Ford Motor is in negotiations with a Chinese company to sell its Volvo cars division, the Swedish business publication Dagens Industri reported today on its Web site. A Russian investor is also believed to be interested in acquiring the division, the report said. Media reports have suggested that the Chinese company involved in talks is Shanghai Automotive Industry Corp.
A Ford spokesman said: "We have been consistently saying since the end of last year that Volvo is not for sale. We are focused on improving Volvo's business results." Ford's new major shareholder Kirk Kerkorian, with a 6.49 percent holding, has stated he would like to see the cash strapped U.S. automotive giant divest itself of Volvo which it acquired for 50 billion Swedish crowns in 1999. Ford's CEO Alan Mulally began a strategic review around a year ago with the sale of Volvo thought to be among his goals. However the company has denied this. A number of automotive companies have been connected with a purchase of Volvo over the last year, including Germany's BMW and Japan's Mazda. 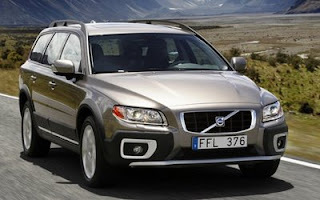 The Volvo brand has shown good growth over the last few years in Europe, and has a revamped model line-up. However, in the U.S. market, Volvo has skidded under exchange rate pressures, triggering several years of sales declines. Rather than reaching for a hoped-for goal of 200,000 North American sales by 2010, Volvo is instead trying to stop a slide below 90,000 units. In response, Volvo calling on many unprofitable U.S. dealers to walk away from the franchise, an effort expected to cut about 20 percent of the dealerships by the end of the year. As part of an extensive cost reduction programme, Volvo is planning to reduce its workforce by 1,400 white collar (consultants included) and 600 blue collar members of its workforce. The company is today handing in a notice of these actions to the Swedish authorities (the Swedish Public Employment Service). The notice includes 1,200 employees at Volvo Car Corporation in Gothenburg (1,105 employees), Volvo Car Sweden (45 employees) and Volvo Cars Body Components in Olofström (50 employees). Also, contracts with around 500 consultants will be cancelled. The company is also planning to reduce its workforce by 300 people abroad. Negative currency effects, mainly due to the weak US dollar, and increasing raw material prices, have for a long time had a significant impact on Volvo Cars' financial situation. Previously, this had been balanced with the help of cost reduction and efficiency programmes. However, with a continued declining US market, continued price increases on raw materials, and weaker market conditions in Europe, the situation has deteriorated. This resulted in a financial loss for the first quarter of 151 million US dollars. In order to improve the business, Volvo Cars is implementing a cost reduction programme which is estimated to reduce the total cost level by 4 billion SEK (approx. 700 million USD). Staff reductions are a part of this cost saving programme. "This is an unfortunate but necessary action if we are to achieve a better financial position", says Fredrik Arp, President and CEO of Volvo Car Corporation. "We must tackle the difficult marked conditions, most of all in the US market. The market contribution to cover Volvo Cars' costs is very small", Arp continues. The third shift at the Volvo Cars Torslanda plant, with 600 employees, is part of the redundancy notice. The company has recently initiated negotiations with the union representatives. These negotiations are ongoing. The formal notice to the authorities today marks the start of a process of reviewing the organizational structure which will continue throughout the autumn, and which will be in place by the end of the year. A number of activities will be carried out with various business partners to assist employees in finding alternative employment. The purpose of these actions is to return to profitability. Volvo Car Corporation continues to invest in its leadership in safer cars with improved environmental performance, and with an attractive modern Scandinavian design language that meets the expectations of customers. The investments will be focused on a concentrated model lineup with, among other innovations, even more fuel efficient engines. The strategy is to continue the successful growth in markets like Russia, China and Eastern Europe, but also maintain a strong position in the established European markets. For the US market, a selective strategy will be used in order to ensure improved profitability.